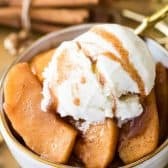 These baked apples are surprisingly simple to make! You'll just need a few fresh, crisp, slightly tart apples, a touch of sugar, and a bit of cinnamon! Preheat oven to 375F and lightly grease a deep 9x9 pan with butter. In a large bowl, stir together your sugars, cinnamon, and cornstarch until well-combined. Add the apples and toss until well coated. Sprinkle with lemon juice and add walnuts (if using) and stir again until well-combined. Transfer apple mixture into your prepared baking pan (be sure to scrape out all sugar/juice from the bowl) and dot with butter pieces. Cover pan with foil and transfer to 375F oven. Bake for 60 minutes or until apples are tender when pierced with a fork, stopping every 15 minutes to stir apples. Serve warm, top with ice cream if desired.